A factory-built performance trim of the Mk II MINI Hardtop, the MINI John Cooper Works (JCW) was introduced in 2009. It was BMW's response to the popularity of the upgrade package that had been offered by the legendary John Cooper Garages to thousands of Mk I Cooper S owners and was heavily influenced by BMW Motorsport's race-bred MINI John Cooper Works Challenge. With stiffer suspension than the standard Cooper S, as well as 17-inch alloys, performance tires, Brembo brakes, a six-speed Getrag manual transmission, and a sporty body kit featuring rear roof spoiler, distinctive badging, and a track-inspired honeycomb grille, the JCW convinced a whole new generation of MINI lovers to swap some additional bucks for its extra bang. Of course the business-end of that bang came courtesy of its Cooper-coiffured 1.6-liter, four-cylinder turbocharged engine, taken from a Cooper S and tweaked until it produced a mighty 211 bhp -- sufficient oomph to take the JCW from 0-60 in 6.5 seconds and up to a maximum speed of 148 mph. Please share your reviews, videos, pictures, or critiques about the MINI John Cooper Worksin the comment section. And be sure to check back regularly to read our very own Simraceway staff give you some insight into the creation of this high-performance machine. Not hugely excited about this car because it's really only the hatch version of the coupe we already have. The torque for this engine is 207 lbf.ft with overboost, yet the website shows 192, which is without overboost, also you quote the Mini Coupe torque in Nm! It would be nice just to use one unit or at least write the unit you are using not just say torque. Since these are very similar cars I would have expected the interiors to be pretty much the same but this new Mini the Interiors is not up to the same quality of the Coupe. 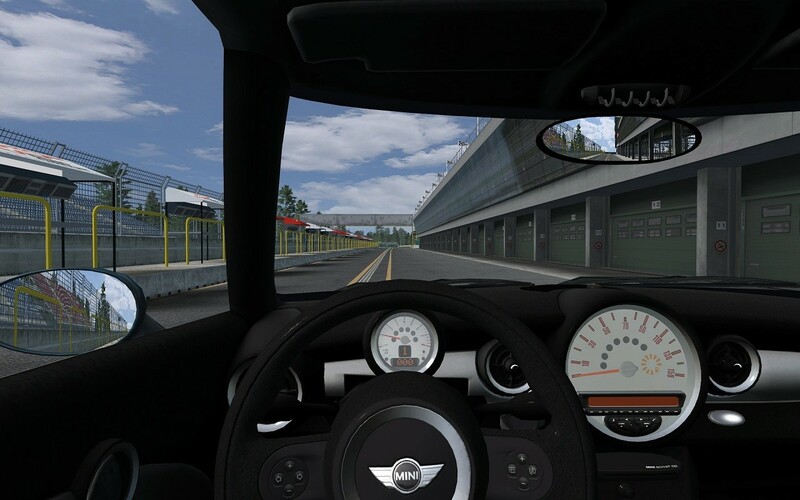 The picture below shows the difference, in the Coupe we got nice textures on surfaces (the new one looks low res and not very good textures), a nice shiny Mini badge on the steering wheel and stitching detail where as on the new Mini these are not the same quality. It's like two different people did the cars, I can't understand why you wouldn't just use the Coupe interior and modify it? The bottom picture show what the 2011 what the Cooper Works Mini Interior looks like, all that needed changing from the Coupe was the rear view mirror, speedo, the coloured trim and some chrome details, it looks like someone has spend the effort making an inferior cockpit when most of the work was already done. The tach in the Mini Coupe was fine yet in this Mini it seems to have a misty finish on it and looks horrible (someone seems to have an obsession with misty finishes on things that should be clear!). The exterior looks good though! Yes despite the interior quality the Mini is fun to drive, though to be honest I haven't driven the new one much yet, but I guess it handles the same as the Coupe (unless they have got different people working on the physics as well!)? 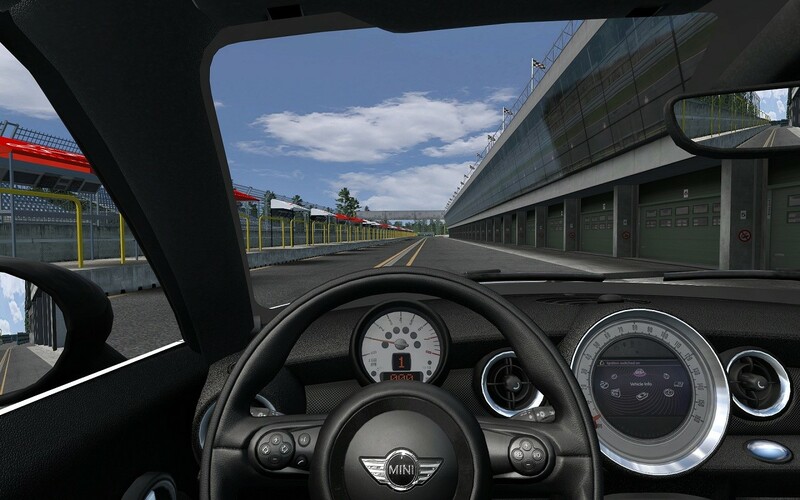 Yes despite the interior quality the Mini is fun to drive, though to be honest I haven't driven the new one much yet, but I guess it handle the same as the Coupe (unless the got different people working on the physics as well!)? Good, I'll probably get this one as well, though I'll drive it from the bonnet view! In the in-game description is written that this car has a V4 engine. Do I need to comment? From a simualtion game people expect realism and accurate informations. A pretty fun car, but I'm not really a fan of FWD cars. I just bought it because it was cheap and it was new.